Discharge lamps (fluorescent, HID) and solid state lamps cannot be connected directly to the mains for its functioning. It required control gear for starting the Lamp. This gear has mainly two functions ignition of the lamp and control of the functioning by supplying the right lamp voltage and limiting the electric current. Control gear conventionally consists of three parts (1) Ballast (coil), (2) Capacitor and (3) Igniter. Commonly the control gear is called ballast. Ballast is classified under following categories. (1) Electromagnetic and (2) electronic. Electronics Ballast: Electromagnetic ballast has electromagnetic ballast, an igniter (not for HPM-lamps) and a capacitor. The ballast lifetime depends on service hours. Normally, magnetic ballasts last as long as the luminaries if they are placed inside the luminaries (and thus are protected against rain). The lifetime of igniters associated with magnetic ballasts does not depend on hours in service but on the number of times that the lamps are switched on. Electronics Ballast: An electronic ballast is mostly one unit that provides both ignition and good functioning (by supplying the right lamp voltage and limiting the electric current) of the lamp. For electronic ballasts, lifetimes of 40.000 to 60.000 hours (10 to 15 years) are considered. The lifetime of electronic ballasts decreases strongly if the working temperature in reality exceeds the indicated working temperature. Electronic ballast includes an ignition device and does not have a separate igniter. Electronics Ballast: Normally the Fluorescent lights are using electronic ballast (called solid state ballast) which consume above 12 watts power. Magnetic Ballast: the stating modes are available in Programmed stat, instant stat, and rapid start Lamp flicker index is 0.04 to 0.07, Dimming is not available for this ballast. Hybrid Ballast: the stating mode is rapid stat, Lamp flicker index is 0.04-0.07. Dimming is not available for this ballast. Instant start Ballast: supply a high initial voltage (over 400V) to start the lamp. High voltage is required to initiate the Discharge between unheated electrodes. Rapid Start Ballast: supply 200-300V to start the lamp, which can heating the electrodes to approximately 1470˚F(800˚C). It starts the lamp with brief delay but without flashing. And for the Fluorescent lamp, warm up time is also minimum 5 minutes. HSPV produce a yellowish light, have a long life, are very energy-efficient, and have good lumen maintenance (maintain light output for a long period of time), but have poor color rendering properties. MH lamps are the most frequently used alternative to HPSV in new installations. They are also quite efficient and provide much better color rendering. However, these lamps tend to have a shorter lamp life (< 10000 hours) and poor lumen maintenance over the life of the lamp. This is popular conversion of laminar. The initial cost of MV Lamp is high and it requires ballast, but MV Lamp have high efficacy and long life make it considerably more attractive than the incandescent lamp. The blue-white color of the clear lamp is generally acceptable, and the arc tube size provides a light source that is small enough to permit good light control. A phosphor-coated outer bulb, featuring both higher output and more pleasing color rendition, is also available. However, the light source is the size of the outer bulb, presenting a problem in light control. The metal halide lamp is a type of mercury lamp in which the arc tube contains, in addition to mercury, certain metal halides which improve both the efficacy and the color rendition without the use of a phosphor-coated bulb. The light source size is that of the arc tube, permitting good light control in the same fixture used for clear mercury lamps. The high pressure sodium (HPS) lamp is presently replacing the mercury lamp. It has golden-white color light output. HPS lamps are normally operated with special ballasts that provide the necessary high voltage to start the lamp. However, lamps are available that can be operated from certain types of mercury lamp ballasts, but with poorer lumen maintenance and shorter life. There are also HPS lamps available that provide improved color rendition or almost instant restart after a power interruption; either feature results in a reduction in rated life. Street lighting Lamps normally used three types High intensity discharge (HID) lamps, High pressure sodium vapor (HPSV), Metal halide (MH), or Mercury vapor (MV). The lamps used in street lighting today are mostly High Intensity Discharge (HID) lamps that include high pressure sodium, low pressure sodium, high pressure mercury and metal halide lamps. In order to reduce the emission of greenhouse gases, the use of energy efficient lamps such as Light Emitting Diodes (LED) for Street lighting has increased. The incandescent or filament lamp was for many years the most commonly used. However, its low efficacy and short rated life have made it undesirable for new installations. At many places tube lights are used for Street Light lighting. Halogen lamp is incandescent Type lamp. It has a tungsten filament filled with halogen gas. HID lamps in general require an external ballast to operate. HID lamps usually take between 1 and 5 minutes to reach full brightness, and if there is a dip in electricity, these lamps will shut off. HID lamps must cool sufficiently to re strike, which usually takes from 1 minute to 10 minutes. Ballasts, which are required by both fluorescent and HID lamps, provide the necessary circuit conditions (voltage, current, and wave form) to start and operate the lamps. All HID lamps require ballast for operation. It is oldest Type of Lamp in HID Type. Prior to the introduction of HPS lamps, MV was the most commonly used light source in highway applications. The MV lamp produces a bluish white light and is not as efficient as the HPS lamp. 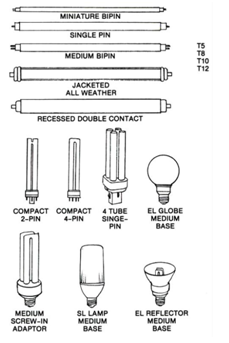 Mercury vapor lamps can provide certain low cost options for replacing less efficient lamps such as incandescent lamps without changing the fixtures. Pulse start MH lamps utilize an improved ballast design to improve operation. MH lamps produce better color at higher efficiency than MV lamps. However, life expectancy for MH lamps is shorter than for HPS or MV lamps. They also are more sensitive to lamp orientation than other light sources. Metal Halide bulbs are as energy efficient as Sodium Vapour lamps. 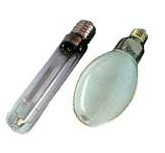 Metal halide lamps are similar in construction to MV lamps. 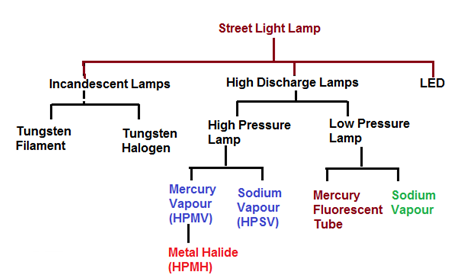 Some MH lamps can be operated off Mercury Vapor ballasts. MH lamps offer a number of advantaged over MV lamps. Warm up Time:2-3 minutes, hot re-strike 10-20 minutes. Application: It is used where color rendering is critical, such as car lots, service stations, athletic fields, industrial manufacturing. High pressure sodium lamps are used for both interior and exterior applications and mainly used for street lighting. HPS is higher efficient and better choice than metal halide for street light applications. HPS is the energy efficient options for halogen lamps as they provide double the amount of brightness for the same amount of wattage. HPS lamps differ from mercury and metal-halide lamps because HPS do not contain starting electrodes, the ballast circuit includes a high-voltage electronic starter. If a Halogen is replaced with Sodium Vapour lamp, 20-25% savings can be achieved. Light Color: golden-yellowish-White, Orange color light. Advances in electronics now make it possible to dim HPS fixtures in a cost effective manor such as production areas and warehouses. Application:Mostly use on Street lighting.